"The year of making ('In Your Dreams') was the best year of my life," says rock legend Stevie Nicks in her documentary of the same name. The film, which was released to home video on Dec. 3, captures the writing and recording of Nicks' most recent studio album. Released in 2011, the set was co-produced by Dave Stewart (of Eurythmics fame), and was her first solo studio effort since 2001's "Trouble In Shangri-La." 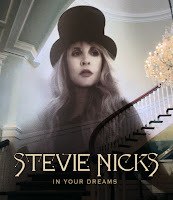 Billboard sat down with Nicks at her home in Los Angeles -- the same house where much of "In Your Dreams" was recorded -- to talk about the new DVD and more. Highlights of that extended chat are in the video below. I love Stevie but I am SO tired of hearing her talk about internet piracy! I have bought every single one of her albums- my mom bought them all in vinyl, then on CD, I bought them again for myself on CD, then AGAIN when the FM albums were remastered, and then AGAIN later as mp3 downloads. People stole music back in the day just as easily- I remember hearing about how people recorded the tusk album off the radio onto a casette which hurt the sales. I have bought SO much music I never would have even heard of because I saw it on Youtube- it was never played on the radio! It is a huge change- but also an opportunistic time to try new things. And who in the heck wants a record company calling all the shots and controlling what goes on an album? Silver Springs wasn't on Rumours...the internet puts it in the hands of the artists. Why when Stevie speaks lately, only her lower mouth moves? I find it odd. I was looking at some old interviews and you could see her front teeth when she spoke. Is this the result of some chin or dental implants? Doesn't matter really. Just curious as to what others thought. Its a strange way to speak without moving your upper mouth at all. TO the first Anonymous commenter ... In the film Stevie mentions not knowing how to feel about finding a better copy of the "Secret Love" demo than the one they had unearthed, and that she was trying to be positive about it. I think she's coming around slowly. I agree with you, it is getting old ... as much as the Internet as revolutionized music and has allowed us to hear and therefore purchase music we wouldn't otherwise know about, there is the flip side to it which is what she means. Record labels don't have the free cash they used to have to go out and harness fresh talent. She does have a point on that. However, yes I agree with you I would be okay with her not discussing it over and over. For years back in the day Stevie said in many interviews that many cassettes of all of her demos were always being made and given to the other members of Fleetwood Mac, as well as to all of her friends. I bought a bootleg Album in 1979 in NYCD which had many songs now on various albums of hers and the bands. So yes it is odd that now she says on stage that these songs were stolen, they were not, she simply is having selective memory of that took place. She acts like it is a violation to her when her demos show up on YouTube, then they were also demos she gave out to many, many people. A bit hypocritical for sure.